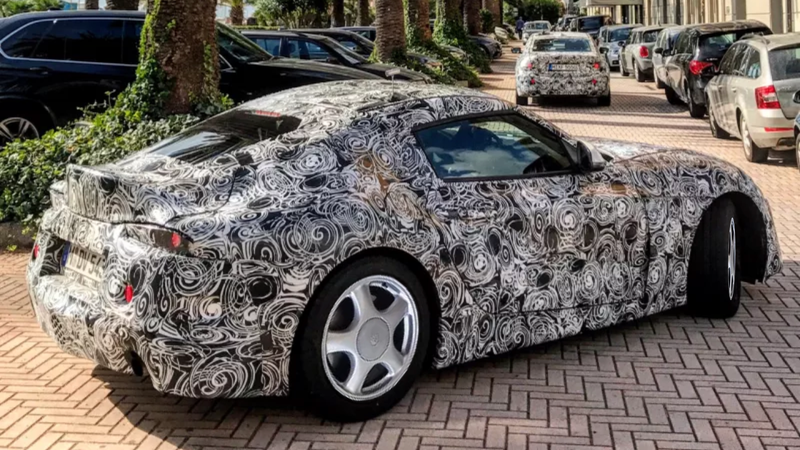 Another camouflaged test car for the new Toyota Supra has been spotted, this time wearing what are likely production-ready wheels that are a ten-spoke, dual-tone black and silver look. How disappointing. The image you see above is a separate image of the Supra photoshopped by me to have old Supra wheels on it (wouldn’t that be nice, though?). The image of the actual Supra spotted testing with new wheels is over at Automobile Magazine, which I can’t steal, so go there to check it out. It’s not a good look. You want it to look like a five-spoke? Make it look like a shiny five-spoke. You want it to be 10-spoke? Make it look like a 10-spoke! You want it to be black? JUST MAKE IT BLACK. Better yet, give me the option of all three, and not this jumbled and confused ugly compromise. This car is supposedly going to be expensive, but you want it riding around on wheels that would look cheap on a Corolla? Literally every wheel option for the GT86 is better than this. Toyota, what are you doing? We’ve come this far. We are so close. Rethink this. If you need some good wheel design ideas, look to your past. Or ask your new pals over at BMW. Don't ruin this for us.